Seals polypropylene and polyethylene bags and tubing up to 6 mil thick. No warm-up required. 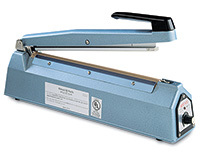 Flat element sealer does not melt through bags and tubing; use scissors or other cutting instrument to trim bag tops and tails. Creates super strong, tamper-evident tail flap seal. Not recommended for sealing material thicker than 6 mil. 16" seal width. Service kit sold separately.